BioStar 2's database has gone through a few changes since it's release. The AC database started out with the SQLite Database and in version 2.2.1, the MariaDB T&A database was released. Starting version 2.3, both databases became Maria DB. Hence the backup method has changed as well. Refer to the image below to see the changes in the Database in BioStar 2 versions. Please refer to the PDF TS0149 attached to back up your BioStar 2.0~2.2.2 database. Note that the AC database can be backed up easily with a copy and paste after stopping BioStar 2 services because it is a SQLite DB. For the T&A database, use the option to back up with the instructions shown in 2.3~2.5 Database Backup below. You will have to install MySQL Workbench to back up and restore the database. Copy the files in the folder and paste it the same path of your new BioStar 2.3 when restoring your T&A. NOTE: It is recommended to stop your BioStar 2 server when backing up and restoring the database. 3. 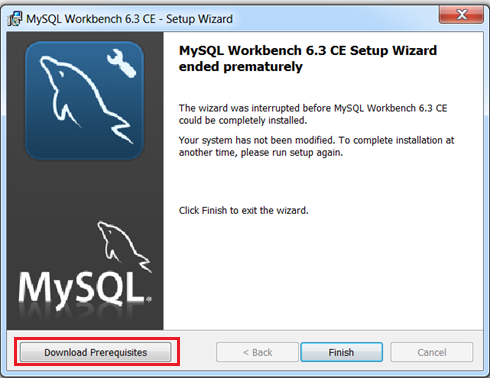 Click Download Now to download MySQL Workbench. Click Download to download the MSI Installer. 5. Click No thanks, just start my download. 6. Run the downloaded file. 7. It will ask you to install the prerequisites. Click Download Prerequisites. 9. 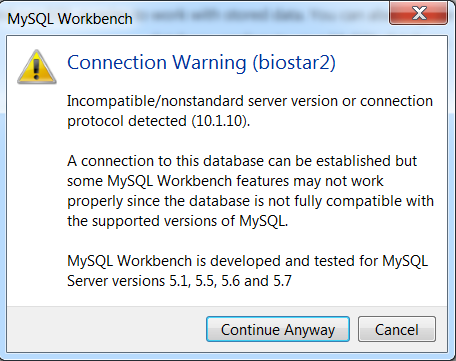 After installing all the prerequisites, run the MySQL Workbench installer again. 11. Click the + sign. 12. Set a name for Connection Name. 13. Set the Port to 3312. 14. Enter your database administrator id in Username. 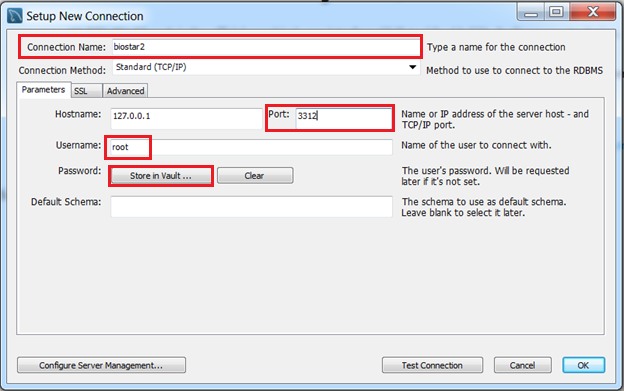 The account you configured in the BioStar 2 express installation is root. 15. Click Store in Vault … and enter password. 16. Click Test Connection and check that it is successful. 17. If you see a Connection Warning click Continue Anyway. 18. Click Ok to connect to the database. 19. Select Data Export on the Navigator. 20. 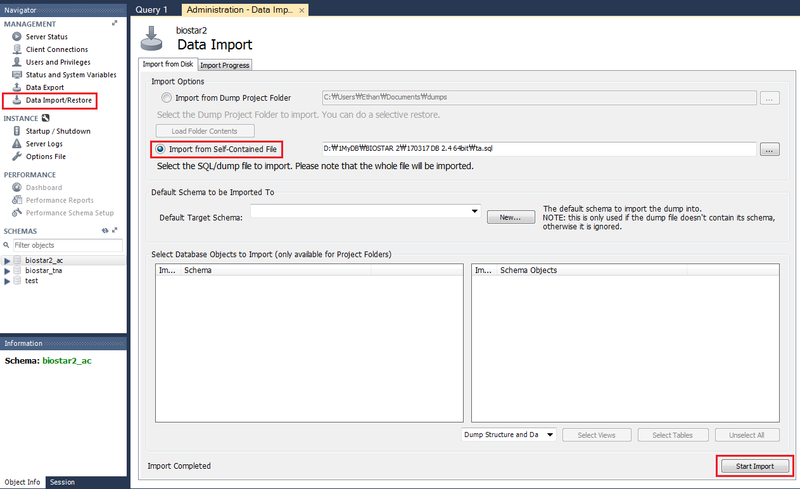 On Object Selection – Schema, select the database you want to back up. * It is recommended to back up the AC and TA database separately. * biostar2_ac is the AC database and biostar_tna is the T&A database. 21. On the right column Schema Objects, check that all tables are checked. 22. On Objects to Export check all three items. 23. 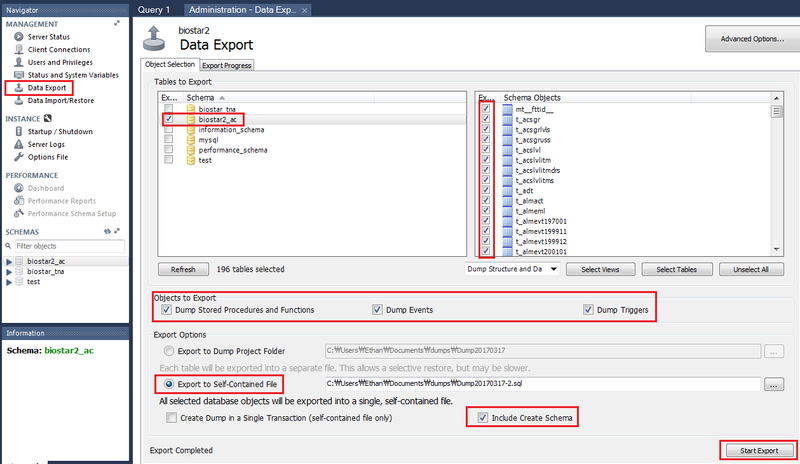 For Export Options select Export to Self-Contained File. 24. Check Include Create Schema. The process will take several minutes and longer based on the size of your database. BioStar 2 video integration was introduced in BioStar 2.5. - You cannot restore a backup of a different version of BioStar because the database structure is different for every version. If you do proceed to make such restoration, it will cause multiple issues with the server, including large amount of system logs, server crashes, device disconnections. - When restoring the T&A database, you have to restore the T&A database that was backed up in the same time as the AC database. If the AC and TA databases are backed up and restored in different time periods, it will cause issues with the server. 1. 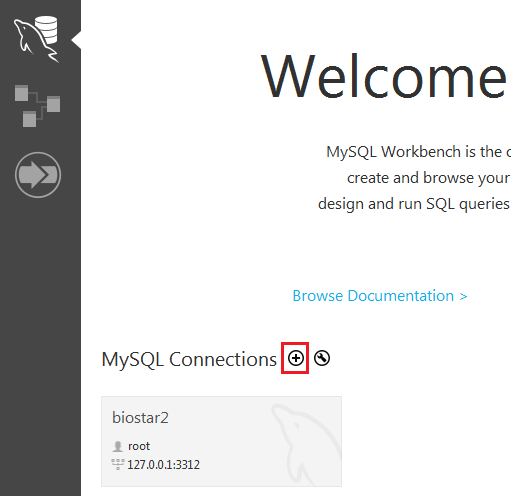 Install MySQL Work Bench and Connect to the database as shown above in the back up process. 3. Click Import from Self-Contained File radio button. 4. Select your file to import by pressing the … button. When you restore the T&A database, you have to stop and start all BioStar 2 services again with BioStar Setting. This must be placed in the directory before starting the services. If you want to restore the image log images, you will have to paste the imagelog folder you backed up before in the BioStar 2 directory.